Plans for a memorial to railway workers killed by a runaway wagon have been put on hold after relatives raised concerns. A meeting in Lancashire on Monday was adjourned after the families of the men could not reach agreement. 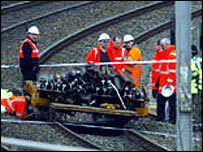 The men died when they were hit by the trolley last month on the West Coast mainline in Cumbria. Three men from north Lancashire and a local man were killed in the accident at Tebay. Michael Chorley, who organised the meeting in Carnforth, said families of two of the men said it was too soon after the tragedy to decide on how to proceed with a memorial. He told BBC Radio Lancashire: "The families themselves are not agreed which way we should go forward at this time. "I shall try and hammer out some consensus between two families that want to go ahead quickly and do something and two that want more time to reflect on this. "So we'll see where we go from here." Ten men were working in the group when the accident occurred early on Sunday 15 February. The four men killed were Gary Tindall, 46, from Tebay, Chris Waters, 53, of Morecambe, Lancashire, Colin Buckley, 49, of Carnforth, Lancashire, and Darren Burgess, 30, of Carnforth. Earlier this month a memorial garden appeared to be the most popular choice to remember the men. Mr Chorley, secretary of the local branch of the Permanent Way Institution that was set up in 1886 to promote better engineering and safety standards on the railways, said these men should not "just slip away and be forgotten".